Disclosure: I participated in a campaign on behalf of Mom Central Consulting (#MC) for the Certified Angus Beef® brand. 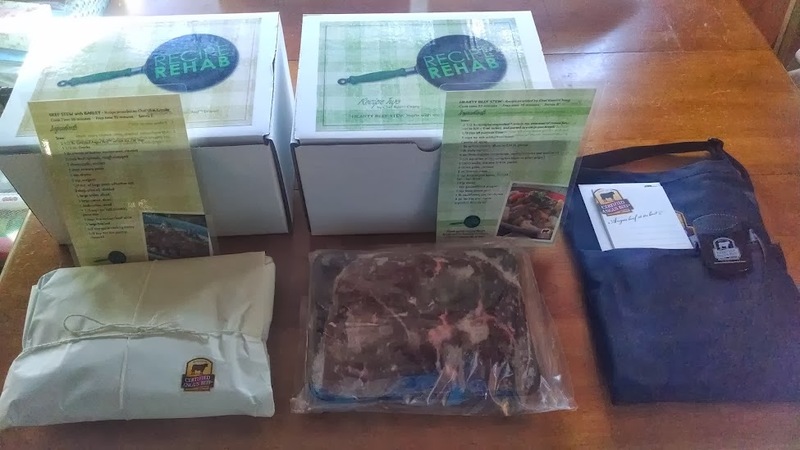 I received product samples to facilitate my review and a promotional item as a thank you for participating. What is your all-time favorite comfort food? For me, it is my father's homemade beef stew, especially when I am sick or during the cold winter months. Not only does the house smell great when he makes it, but it really does warm the stomach, and makes me feel good. So, when I was recently asked to try out new different beef stew recipes, which will be featured tomorrow morning, Saturday, Feb. 15th, on Recipe Rehab. "Families submit their favorite high-calorie, family-style recipes, and two chefs face off in a head-to-head competition to give the recipes a low-calorie twist. After making each rehabbed recipe in their own kitchen, the family chooses their new favorite. This recipe makeover challenge promotes using healthy, wholesome ingredients and demonstrates how a few modern changes can transform a family favorite into an even healthier meal." 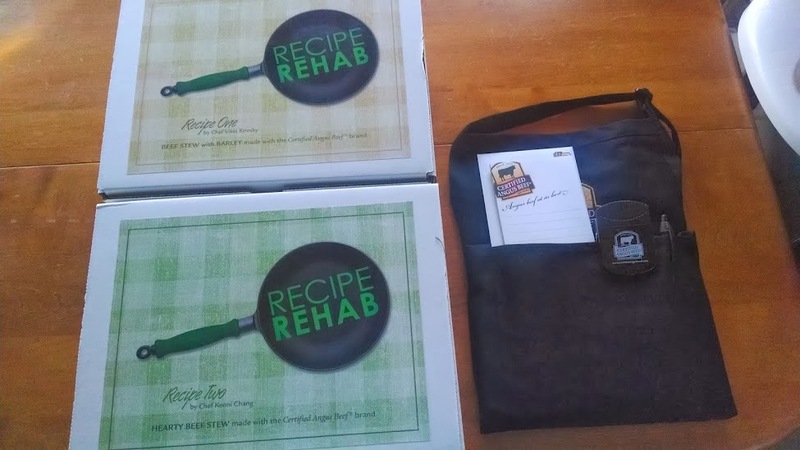 Prior to being asked to take this challenge to see which of the two reinvented recipes (chef created from family submitted recipes, with a low-calorie twist) my family liked better, I had never heard of Recipe Rehab. After checking out the official website for the show, I couldn't believe I hadn't heard of it before, but so glad that I finally found out about it, as I will be tuning in from here on out. I have to say that out of the different recipe challenges I have participated in, this one has been my favorite. While I was reluctant to try different beef stew recipes, I was curious how these two beef stew recipes would taste as the color photos were so mouth watering, I just had to try them out. But, I also didn't want to find myself falling in love with another recipe and having my dad feel hurt. After talking to my father about this fun challenge, I was surprised to hear that he wanted to come visit and help make the two recipes with me. 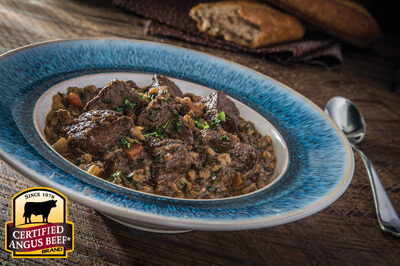 He wanted to see if he would reinvent his beef stew recipe by adding new ingredients found in these two recipes, to his tried and loved beef stew. Add mushrooms, spinach, garlic, tomato paste, thyme and oregano to food processor. Pulse lightly until vegetables are roughly diced and mixture comes together. Pat cubed meat with a paper towel to absorb excess moisture; this helps beef brown when seared. Season beef with salt. In large Dutch oven or pot on medium-high heat, add one tbsp. olive oil. Working in batches so as not to crowd the pot, brown beef a few minutes on each side. With slotted spoon, remove browned beef and reserve. Add remaining olive oil to Dutch oven, and then the diced onion, carrots and celery. Sauté for 5 minutes. Turn heat down to medium and add mushroom mixture, mixing well with wooden spoon. Place meat back in pan; then add the wine and stock (liquid should cover meat and vegetables). Add bay leaf, cover pot and place in lower part of the oven. Cook for 40 minutes. While beef is stewing, add barley and 2 cups water to a medium pot. Bring barley and water to a boil; lower heat and simmer 10 minutes or until tender. Strain any excess liquid. After 40 minutes, remove pot from oven and stir cooked barley into stew. Return pot to oven so stew can continue to cook 10 more minutes, or if time permits, up to an hour. The longer stew cooks, the more tender the beef will become. Serve stew in a shallow bowl and garnish with freshly chopped parsley. In 2-quart mixing bowl, whisk flour and beef broth together until any lumps are gone. Spray pot or Dutch oven (6-quart) with oil and place on medium-high heat. When pot is heated, brown beef in three batches, adding more spray for each batch. Do not overcrowd pot; its bottom should be visible. Spray nonstick sauté pan with oil and heat on medium high. Add onions and cook, stirring occasionally, until brown and soft. Remove from pan and reserve; repeat with carrots, cooking until browned. Once beef is browned, add mushrooms to Dutch oven and cook for 1 minute. Add wine; cook until reduced by half, about 3 minutes. Return browned beef to Dutch oven; add caramelized onions and carrots, as well as celery, garlic, tomato paste, thyme leaves, bay leaves and ground pepper. Stir in flour and beef stock mixture. Bring pot to a simmer, then reduce to low heat and cook for 45 minutes, or up to 2 hours if time permits. 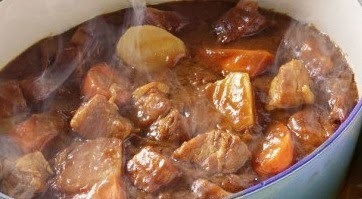 (The longer the stew simmers, the more tender the beef will become.) While stew is simmering, occasionally check it and skim any excess fat from the top. Bring 4 quarts water to a simmer in large pot. Place cauliflower florets in simmering water and cook 8 minutes or until tender. Drain and keep cauliflower warm. Remove stew from heat and stir in lemon juice. Divide cauliflower equally among 8 bowls, then ladle stew over cauliflower. Garnish each bowl with a dollop of sour cream and sprinkle with small pinch of fleur de sel. The first thing that my father found that was different from his recipe is that both of these recipes used Certified Angus Beef® brand. When he makes his recipe, he relies on my mom picking up the stew meat, and she bases her selection on what is on sale - and not on best quality. So, depending on the meat used, sometimes the meat is chewy or tough, while other times it is nice and tender. Also, like these two recipes suggest, the longer you let the stew simmer for, the more tender the meat becomes. This was another thing my father said he would make a point in doing, as he tries to rush when he knows we are all eagerly awaiting his beef stew when he makes it. So, what sets Certified Angus Beef® brand apart from other beef on the market? Every time you see the Certified Angus Beef® brand you will reassured that this beef has met 10 standards for premium quality, including abundant marbling (little white flecks within the red meat that melt when cooked, basting beef from the inside out, for exceptional mouthwatering flavor and juiciness). Who knew? I always though the white flecks met fatty meat that when cooked up would be tough or unappetizing. I know how that when I reach for a package of Certified Angus Beef® brand that I will be serving my family the best cut of beef -- which is a cut above USDA Prime, Choice and Select grades. Interested in the nutritional facts of beef in your diet? Calorie for calorie, beef is a nutrient powerhouse. Beef has ZIP -- Zinc, Iron and Protein - nutrients that are essential to a healthy, balanced diet. 29 cuts of beef are lean (less than 10g total fat, 4.5 g saturated fat and 95mg cholesterol per 3.5 oz. serving). To find a lean cut, look for "round" or "loin" in the name (ie. strip loin, tenderloin, round roast). In addition to Certified Angus Beef brand being the best cut of beef, I was also surprised to learn that this is the world's brand of beef, and was established in 1978. This brand supports local farmers and ranchers across the country, thus being able to offer consumers the best beef each and every time you sit down to enjoy it with your family. Premium Certified Angus Beef brand steaks, roasts, ground beef and deli meats are available around the world at only the best grocery stores and steakhouses. To find restaurants and local grocers who carry this trusted brand, click here -- www.certifiedangusbeef.com/buy/. So, which of the two recipes was my family's favorite? The tasters included my husband, Savannah, Bella, myself and my parents -- 6 people in total. I was hoping that even with an even number we wouldn't end up with a tie. It took two votes and some discussing the reasons why we liked a particular recipe over the other, but in the end we all decided that the Hearty Beef Stew recipe was hands down our favorite -- that is...next to my dad's. 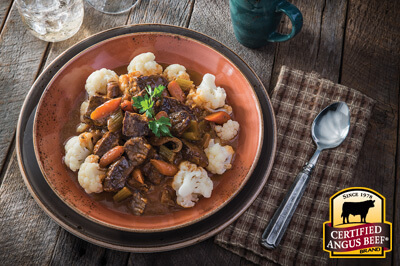 When it comes to beef stew, we are used to it with vegetables like carrots, potatoes and celery. My dad likes to add turnip to his recipe -- but, neither of these two recipes included this. 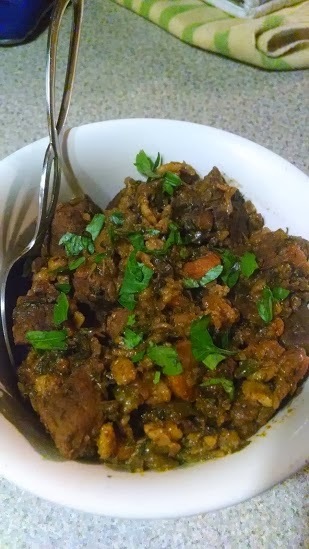 With the hearty beef stew recipe, everyone in my family was surprised at how much they loved the flavor that both the cauliflower and shiitake mushrooms gave it -- a nice earthy taste. I would never have thought to add cauliflower to a beef stew. My dad, felt the same way, and said he would try adding this and the tomato paste (another ingredient he never uses), when he makes his beef stew for us soon. I can't wait to tune in tomorrow AM to the award-winning Recipe Rehab show to see which of the two beef stew recipes is the winner. Check your local listing to see when this show airs in your area. Click here to find out what time Recipe Rehab airs in your area. These recipes look so great. I really love the beef stew with barley one. This is such a great idea to take high calorie meals and have a contest to create the best low cal one. Thanks for sharing.